Dunmyer Cemetery was named after Lewis Donmyer (originally Dormeyer). In 1849, he donated land for the establishment of an Evangelical Lutheran Church and a church building was erected, and in 1860 the graveyard was set off and fenced. His wife, Catherine Shaffer Donmyer, was the first to be buried there, in 1862. In the years following the Civil War, Lewis and most of his grown children and their families migrated to Saline County, Kansas, Lewis himself making the move in April 1871. The original parish register for the church is in the archives of the Lutheran Theological Seminary in Gettysburg. Dunmyer Cemetery is located on Route 160 between Elton and Salix. 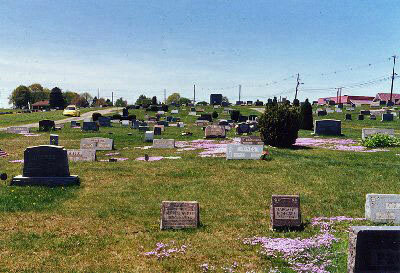 It is an old cemetery dating back to the early 1800s. In the old section there are many stones that are laying face down and can not be read or weathered beyond being readable. The church once sat in the middle of the old section of the cemetery but was moved many years ago down the road about a quarter of a mile. It now is a Baptist Bible Church. The new church is now located on School House Road in Richland Township.